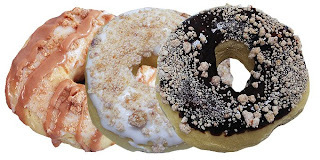 How would you like to win PRIZE PACK from Holey Donuts! of some of their delicious donuts? They are giving away their February Love Assortment which consists of 4 boxes of their latest, best selling, super yummy Holey Donuts! Low Fat Treats AND $250 Holey Donuts! store credit good for one year. To enter is easy! Just join the Holey Donuts! mailing list so not only are you entered into the draw but you also get special offers, discounts and free shipping. Contest runs until February 28, 2010. Click here to enter. Please put the name of my blog, Simply Stacie in the subject line and then just your name and email in order to enter. Please enter only once. The blogger who has the most people sign up wins $500 so please help me win!!! Thank you so much! !